Just checked out a video of McCain on Letterman. Noticed a couple of interesting features that YouTube is giving folks like CBS. First there was an ad before the video, second the video played in H.264 although it did have a link for the “normal quality” version and third there were a couple of nifty DHTML buttons up at the top. Notice that everything but the video is grayed out. That is because I clicked the little film strip icon at the top left which stands for “theater mode”. You will also notice that the video is in the middle of the page with goofy graphical curtains surrounding it. The icon directly to the right of that one, the little light bulb controls graying out the screen regardless of the theater mode selection. Also notice that the ad at the top right (which reads CBS … and originally was a Schwab ad which matched the preroll video ad) is not grayed out. In any case, none of this is new. (For reference do a Google/Yahoo search for “lightbox” to find a plethora of resources for accomplishing the same thing.) 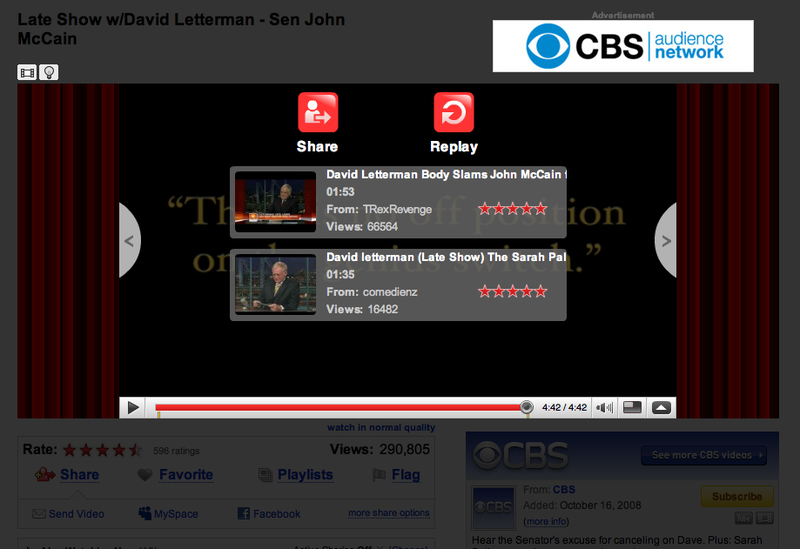 But is interesting to see what extra features and functionality YouTube is giving to folks like CBS. Wow, those curtains are CHEESY. Maybe hey’re starting to feel pressure from the far better experiences of Hulu and the like? Another interesting feature you may like, which could also tie in well with annotation deep linking… they just added functionality to link to a particular time inside of the video. By adding “#t=1m30s” (where 1 is the minutes and 30 is the seconds) to the end of any youtube link, you can set the minutes and seconds for starting. Potential is good for documentation and nested presentation formats. A friend who works for Google doing video advertising stuff told me some other things to do with YouTube that I, at least, wasn’t aware of. They do HD video now. You can have your own channel, and if you generate sufficient traffic they share revenue. They allow content creators to insert comment bubbles similar to what you’d see on Viddler (though only content creator can place them).